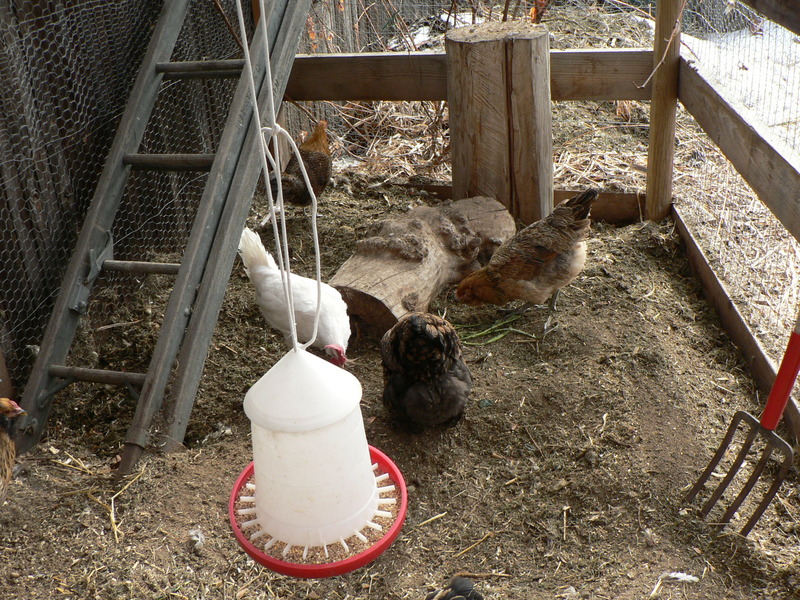 After our fox attack last week, I decided not to give the remaining two Ameracauna pullets too much time to get used to having the whole coop to themselves, lest they make things as difficult for future newcomers as my older girls did to them. I learned a year ago that when a pecking order is disrupted by the loss of the head bird(s), it’s a great time to introduce new members to the flock. Rather than old residents picking mercilessly on the newcomers, everyone has to negotiate a new relationship with everyone else. The brief solitude did get Scramble and Omelet going into the coop to sleep rather than perching outside every night, so I am thankful for that little improvement. It’s not so much fun to have to pry two screeching chickens from a high ladder and stuff them into their house every night after dark. (And who would do that for us when we were out of town?). 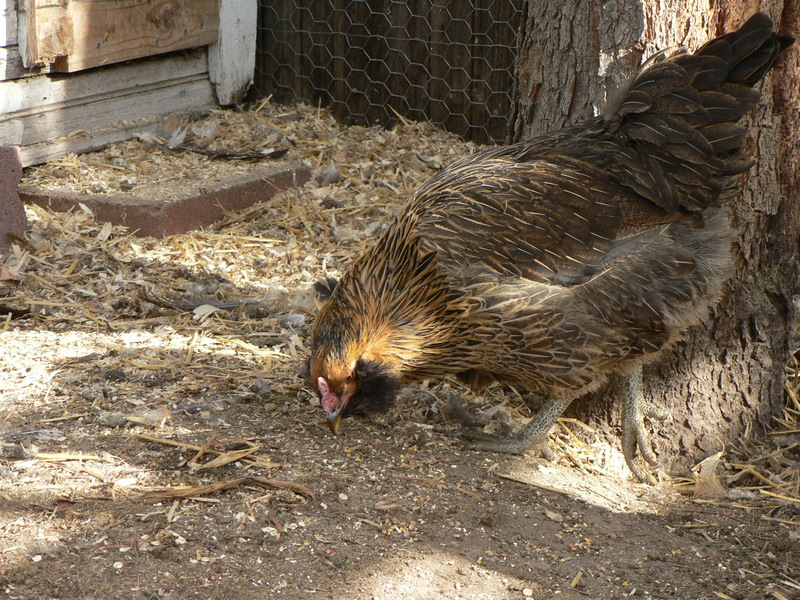 My older girls were effective bullies, so Scramble and Omelet preferred roosting outside over the hostile environment in the henhouse. 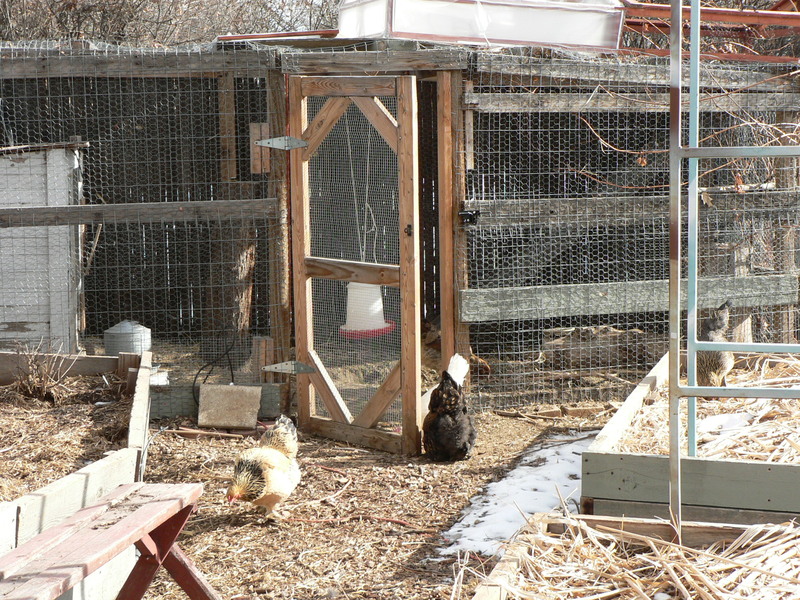 Now they suddenly had the coop to themselves, and they immediately ‘moved in’ for the night – a good start. 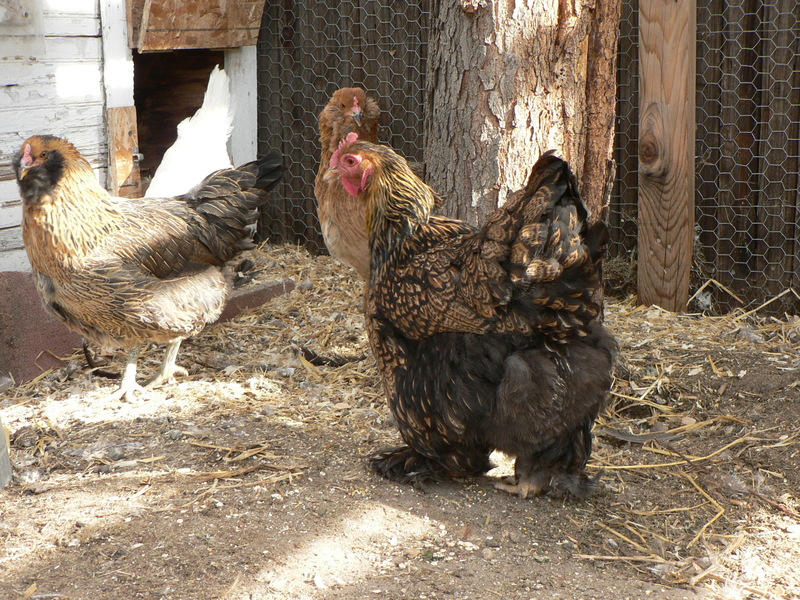 After a flurry of Craig’s list contacts and calls, I drove down to Parker to pick up a very eclectic four-some of hens. One was a Buff Brahma, which is what attracted me to the ad in the first place; Pot Pie and Tandoori endeared themselves to me in short order and I miss them badly, so I really wanted another Brahma. 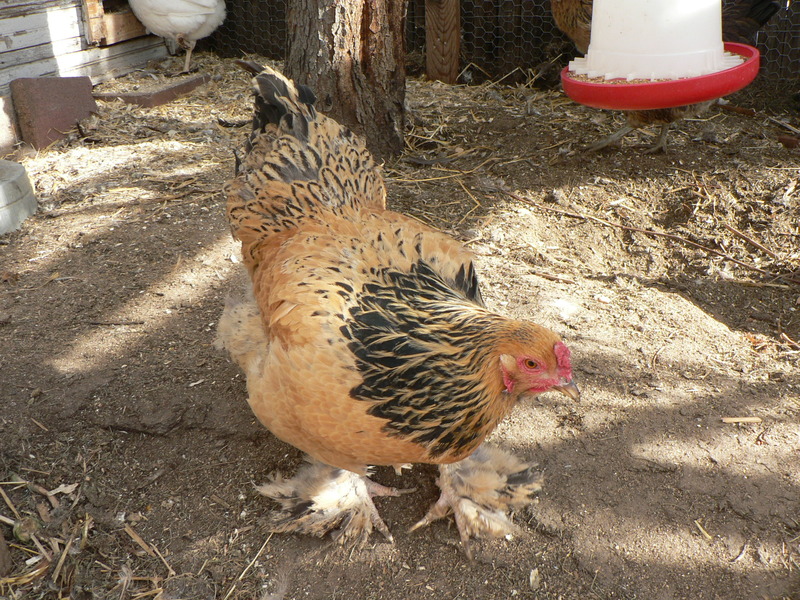 I knew I wanted a couple of reliable layers, and one of the chickens was a Leghorn; another was a Campine, a beautiful, petite breed known to be excellent layers. 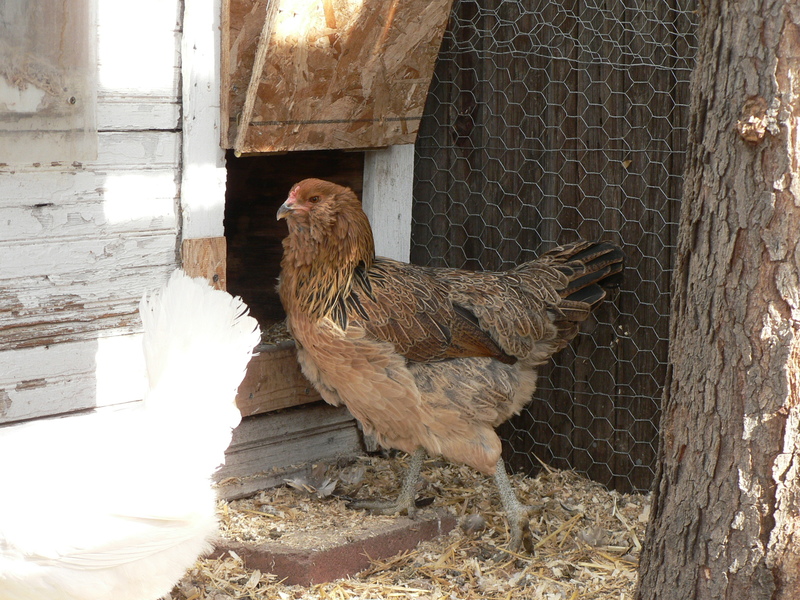 The fourth was a Cochin, a breed I’ve wanted since I first thought about getting chickens. They have less than stellar egg production but are beautiful, gentle fluffballs – so this hodgepodge group of chickens really appealed to me as a varied and interesting mix of birds. They’ve been home with me for almost a week now, and today I let them out of the covered run for the first time. For Scramble and Omelet it was the first excursion since the fox attack, and they launched themselves into my raised beds with gusto, eventually finding their way back to their beloved dust-bathing spot under my potting bench. The 4 new birds stayed closer to home, gradually venturing across the yard but spending 80% of their time in and very near the run. When it was time to take Copper for a walk, it was a cinch to herd everyone back into the run. Whether it will remain that way when they all feel more settled is another question. Here are photos of ALL the girls, since I didn’t get photos of the Ameracaunas before today (those dark, short winter days just don’t present many opportunities for picture-taking!). 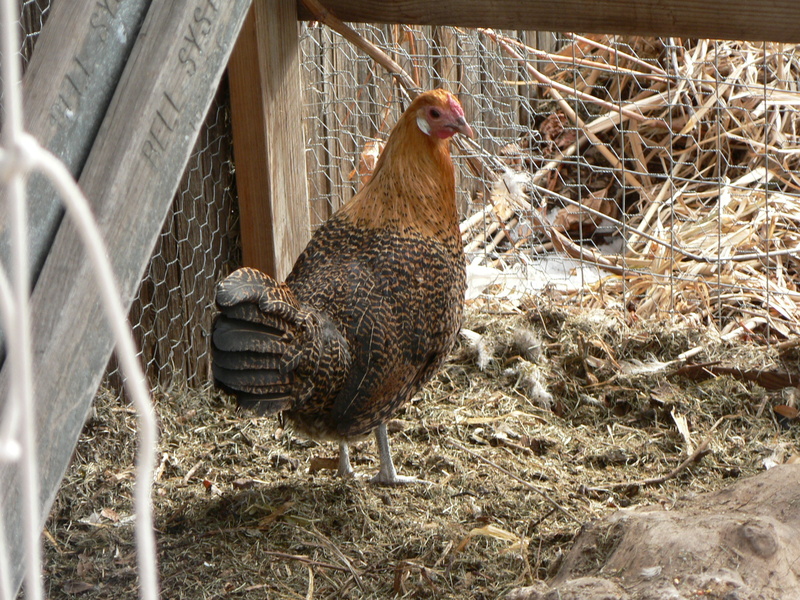 Omelet, one of the two Ameracauna sisters who escaped the fox. They are much more at ease with this new group of chickens than they were with my old four. Scramble, the other Ameracauna. She is a little bolder and less flighty than her sister, and I'm hoping she will tame eventually; she seems to be quite intelligent and spunky, and I love her cheeky expression. 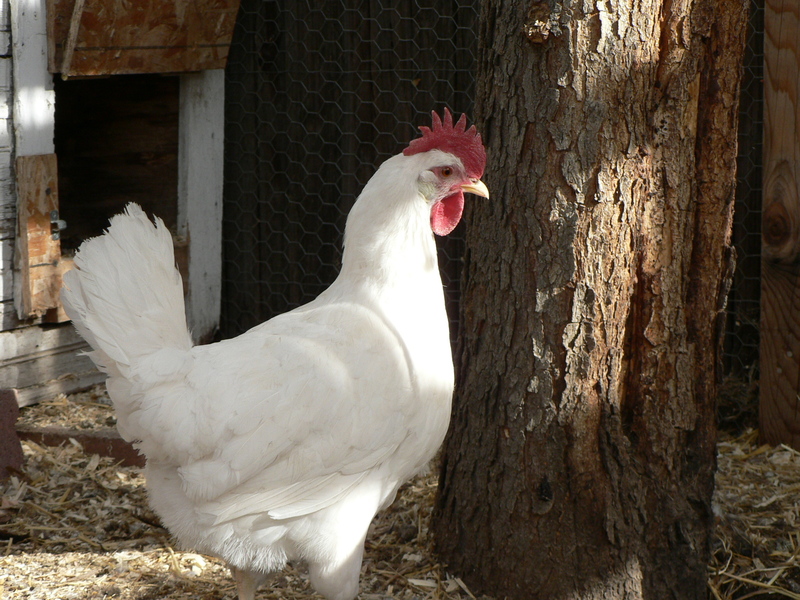 The Leghorn, whom I've predictably named Foghorn. She's a pretty bird and skittish around humans, but seems to be getting along wonderfully with all the other birds. She neither pecks nor gets pecked and seems to be a great forager who stays busy. The Buff Brahma. So far she has been the most approachable of the current group, though I'm giving them all a few days before I try to grab anyone for forced attention. Her former owner's boys called her Buffy, and I haven't had the heart to change her name; it's stuck already. My two nutty Ameracaunas with the new Cochin, who doesn't have a name yet. She's huge and has gorgeous plumage. This chicken is definitely the new boss hen; nobody is disputing her authority. Would you? The Cochin having a drink. Her shape is rather like a basketball. If nothing else, she'll be useful for keeping the other hens warm on cold nights. Though I should give her credit for laying two eggs this week, while everyone else is still on strike while they get acclimated. This little sweetheart is a Golden Campine. They top out at 4 pounds, and since she was hatched in 2009 I doubt she's even that big yet. She's as flighty as they come, but not stupid - just chicken. Hopefully she'll settle down just a little with time. I've named her Henny Penny. Everyone exploring the immediate vicinity of the run. You can barely make out Scramble in the raised bed on the right. In the summer, a grapevine grows over the right side of the run and provides welcome shade and tasty, edible leaves for the girls. A view of the inside of the run, showing the space our girls are confined to most days. 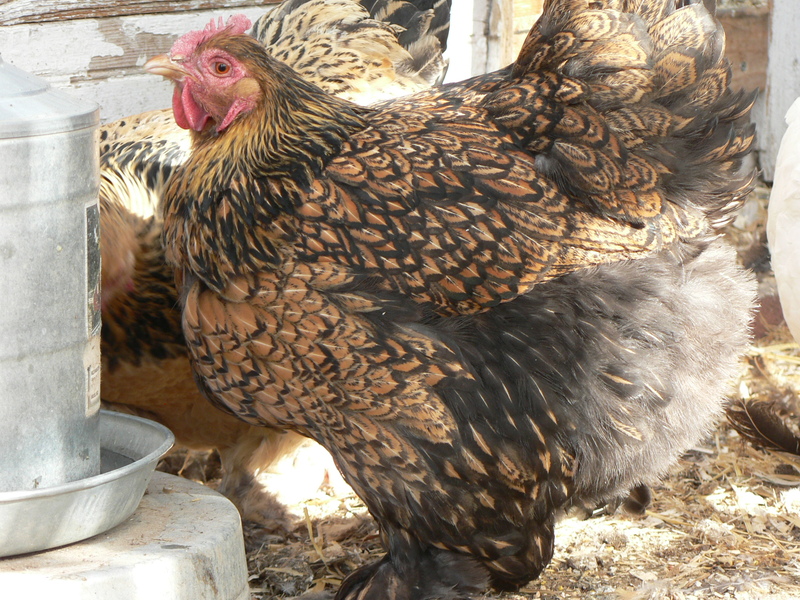 I'll be able to let them free range only when I'm in the garden, or put them in the mobile coop. This, though, is their permanent home and they don't seem to mind its small size all that much. Here, they're all inside even though the gate is wide open for them to roam about the rest of the yard.